Yesterday was my Birthday and this is a present I was given by George Ward aka DungeonWarden of Dungon Legacy. His comic, like mine, is based on D&D but has been running for a lot longer. 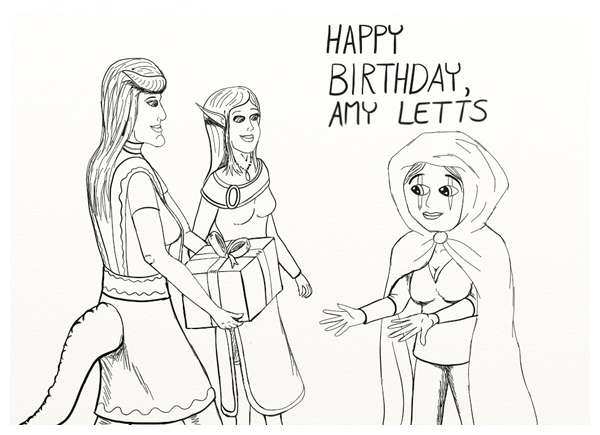 In this picture Karlaia and Arlina are handing Amuletts a gift. I wonder what’s inside? Hmm, that box is too big for a Deck of Many Things, perhaps it’s a Bag of Holding. Amuletts is very fond of her extra-dimensional spaces. Then again it could be full of gems!! Well, whatever it is, lets hope Amuletts does not floccinaucinihilipilificate* it. TGT Webcomics also wished me a Happy Birthday on their podcast, so you should check that out too.